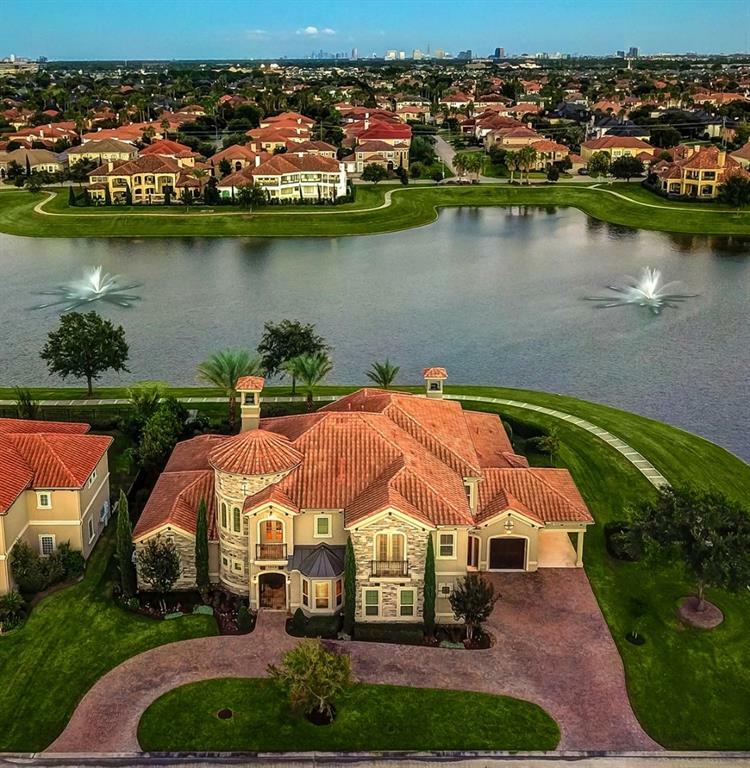 Stunning Mediterranean Waterfront Custom Built Residence with amazing views of fountains & lakes from ALL living areas. Home displays elegance and sophistication throughout. Located at the prestigious manned gated Lakes of Parkway Community on a premium lot,surrounded by water and lush landscaping.This tastefully appointed custom built home features 4 bedrooms, spacious Master Retreat overlooking relaxing pool to lake views & a sought-after secondary in suite bedroom downstairs, formal dining, formal living, handsome study and a centrally located family room open to gourmet kitchen with top of the line appliances & breakfast room with direct access to covered verandas and resort style sparkling pool. Second floor offers 2 bedrooms, huge game room and a unique wine room with cellar with access to covered balcony with the most splendid and relaxing sunset-lake views.Luxury lifestyle waterfront living at its best, that every so often we see active for sale inside LOP. Unique Exquisite Modern Style home inside sought after Lakes of Parkway manned gated community. This estate home offers expansive clean lines with fresh crisp white spacious living areas with an open floor plan for today's lifestyle. Boasts high ceilings that emphasize the open floorplan. Located on almost a 1/2 acre double lot it was remodeled in 2015 with over 200K per seller in upgrades. Features a stunning stucco façade elevation, Tile roof, resort style pool with pool bath with outdoor shower and summer kitchen; 5 bedrooms, Spacious Master Retreat downstairs with a Spa like bath, Formal dining, Formal Living, Open Gourmet Kitchen to Breakfast and Family room that overlooks covered veranda and summer kitchen, sparkling pool & spa and extra huge green space area. Upstairs features 4 very spacious bedrooms with holly wood baths, huge game room and media. This home offers incredible entertaining capabilities with amplitude as no other....Close to The Village School secondary entrance. 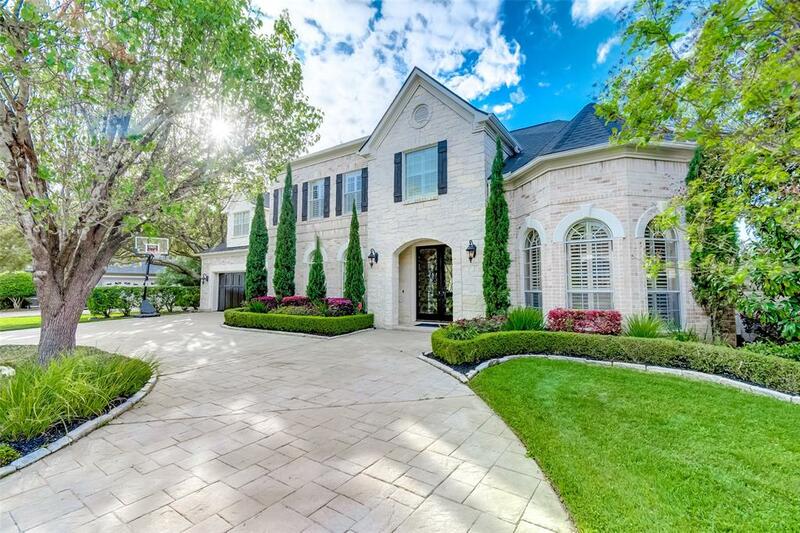 On a coveted lake front lot, the offering at 2216 Camden Creek provides an opportunity to live in The Parkway @ Eldridge with its 24/7 guard and excellent amenities. 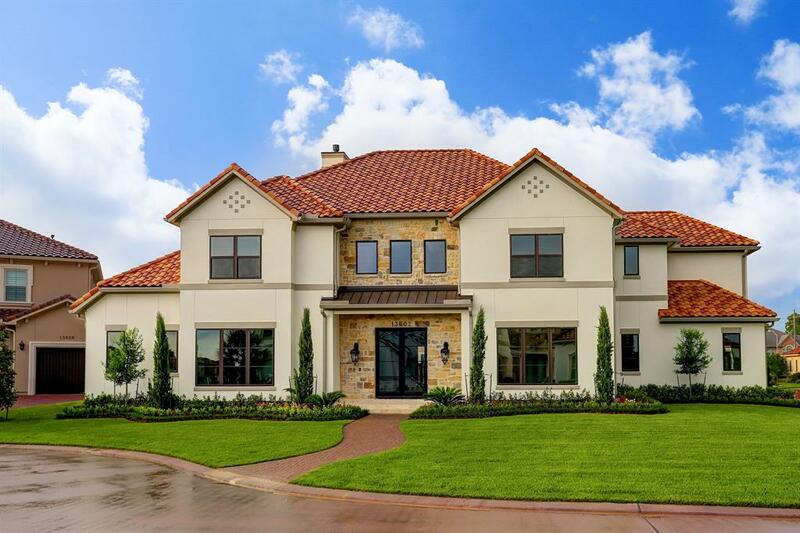 Say "Hello" to the fresh new style featuring brick exterior, flat tile roofs, and standing seam metal roof accents that provide the farmhouse look made popular by Joanna Gaines. A first-floor master and three bedrooms plus a game room and separate media room on the second floor make for a great floorplan! The Parkway entrance is located just west of Eldridge on Rincon (between Briar Forest and Westheimer). 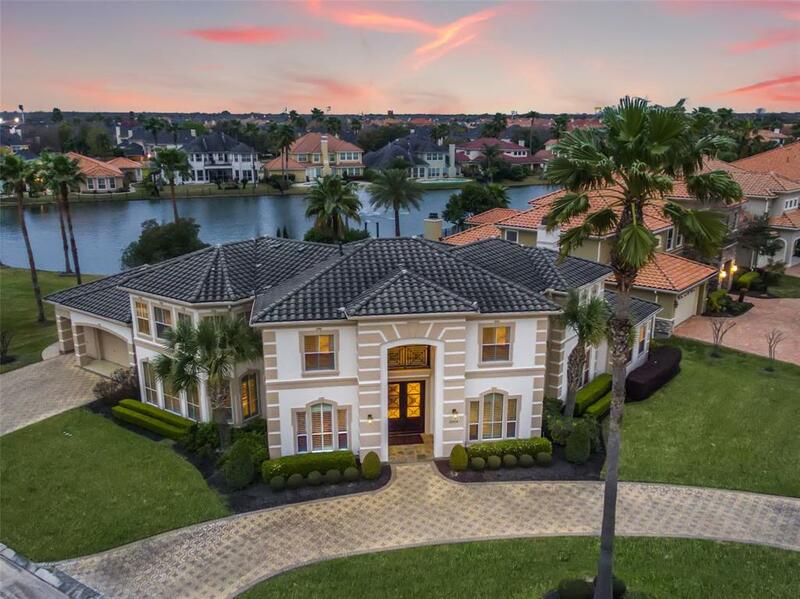 Stunning lakefront Mediterranean style in Lakes of Parkway offers formals, study, and family room open to a beautifully updated island kitchen. Amazing outdoor space with lake views offers lounging areas, pool with spa and waterfall feature, and tons of space to entertain in a pristine setting. The first-floor master suite boasts sitting area, crown molding, plantation shutters and a luxurious bath with separate shower and tub. Elegant kitchen and breakfast room are adjoined by built-in bar area with double beverage coolers and wine rack. Upstairs you will find a spacious game room with wet bar, 4 additional bedrooms, and a balcony off the game room overlooking the yard, pool, and lake. Don't miss this fantastic opportunity to live in a gated community hosting many amenities for its residents! Luxury and security reign behind the 24/7 manned gated entrance of The Parkway at Eldridge. With an open, inviting, light-filled, flexible floor plan, this home suits a variety of lifestyles. Professionally- equipped open kitchen. First-floor master suite with lavish bath. One secondary bedroom located on first floor with additional bedrooms upstairs. 3-car garage. Neighborhood amenities include tennis, playground, and pool. Located in the heart of the Energy Corridor, The Parkway homes did not experience any flooding during Hurricane Harvey . Stop by sales office/model home for easy viewing. More inventory homes available. 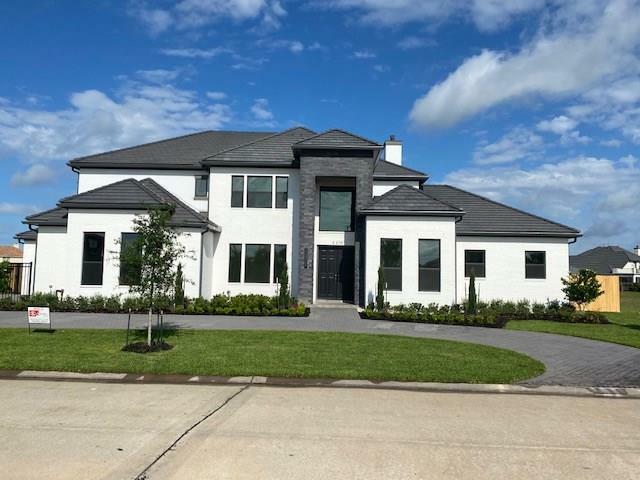 Featured in the Lakes of Parkway Tour of Homes 2019, this unique and sophisticated place impresses with its endless list of custom updates. 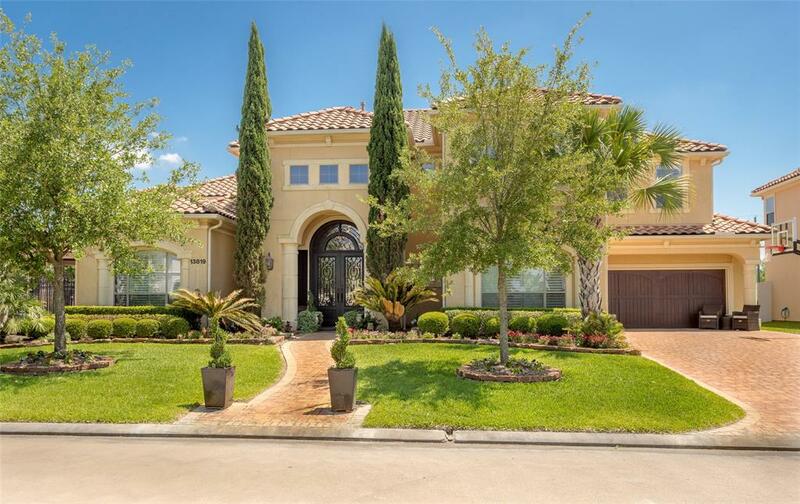 Gutted to the studs and completely reconfigured in 2012, this home offers an open floorpan with dual staircase access, natural wood and travertine throughout, custom cabinets in all common areas with tons of storage, wine cellar, oversized bedrooms, fully equipped media room, 3 car tandem garage! Marvelous master suite with a lake view, fireplace, his and her California Closets® and so much more! Heated saltwater pool with in-floor cleaners, next to outdoor kitchen! Peaceful and private courtyard! Breath taking sunsets over the lake! Walking distance to exemplary public and private schools! This gem could be yours, request your appointment! 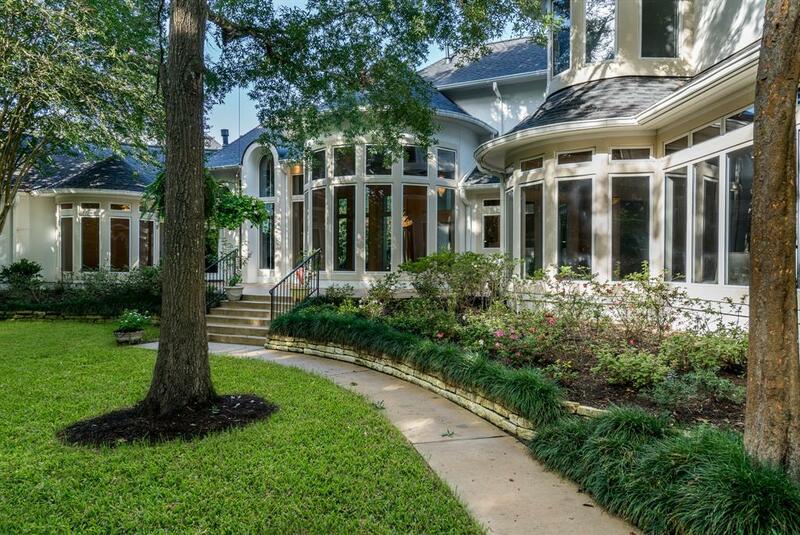 One-of-a-kind executive home in the heart of the Energy Corridor! The layout of this home makes it ideal for entertaining. The gated community of Enclave Lake is situated around a large lake with water features. This private half -acre backs to green space on two sides and has water views to the front. Close to Terry Hershey park and minutes from BP, Shell and Conoco. Remodeled /Re-built after Harvey dam release, the owners have spared no expense in rebuilding this elegant but livable home. Dramatic high ceilings in the dining and formal areas greet you when you enter the double door entry! Wood, marble and carpet floor coverings and granite counter tops throughout. Remodeled kitchen has new stainless steel appliances. Swimming pool with rock water fall feature behind and outdoor kitchen along with many other features makes this an incredible home for friends and family. Please ask for the list of features and upgrades that are too numerous to list here. Make your appointment today! It's lakefront location and large lot will make this a highly desired property in The Parkway @ Eldridge. As a Kickerillo Signature Custom Series home it will feature a high end finish package. The neighborhood amenities include a 24/7 guarded entrance, pool, tennis, and playground. The sales office is open daily from 10 AM - 5 PM and it just inside the guard gate. Gorgeous, sun-filled, 5 BR, 4F/1H bath home in the quiet community of Lakes of Parkway. 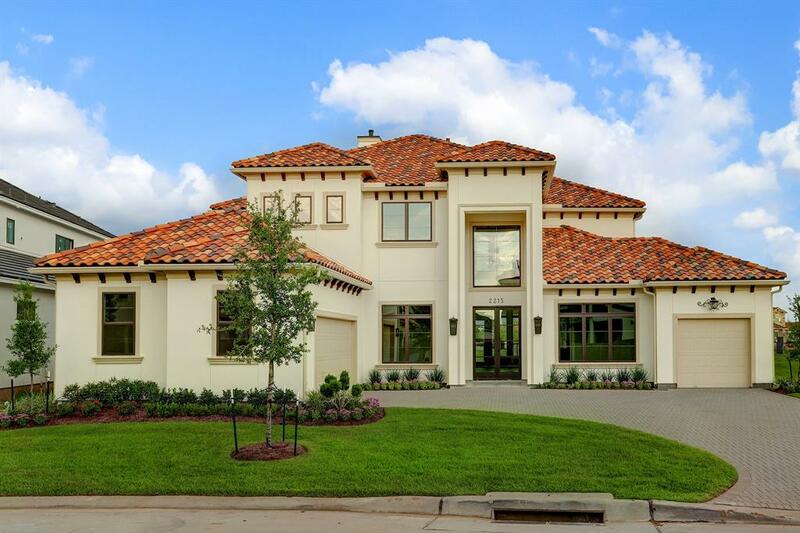 Designer finished home with 4 car tandem garage & fully equipped w/outdoor living, office & play room. Large heated pool w/spa & waterfall. Spacious backyard with a grill and large playset. All bedrooms ensuite, master BR has large sitting area, wall of windows looking over beautiful pull and backyard, walk in double closets and large bathroom with soaking tub and 20 ft ceilings. Laundry room conveniently located next to kitchen. Impressive first floor office w/built-in shelves & extra storage over looks the beautiful lake. Cooks’ kitchen overlooks entire backyard for ease in watching children play in the pool/yard. Huge pantry & large breakfast room w/seating for 8. Additional living space off the kitchen. Large formal dining room has beautiful lake views. There isn't a detail missed in this beautiful house, it is a must see!